I've got a great Christmas tutorial to share with you all today! I made mine and hubby's very first stockings together! And let me tell you. I love um so much we're using them until we're 80. NO JOKE. I wanted a pretty neutral stocking, but still wanted it to be cute. I picked a linen with a gold detail and a matching base fabric for the accent top and bow. The little bow and the wooden initials are what make them so adorable I think!! Be warned: picture heavy tutorial ahead! 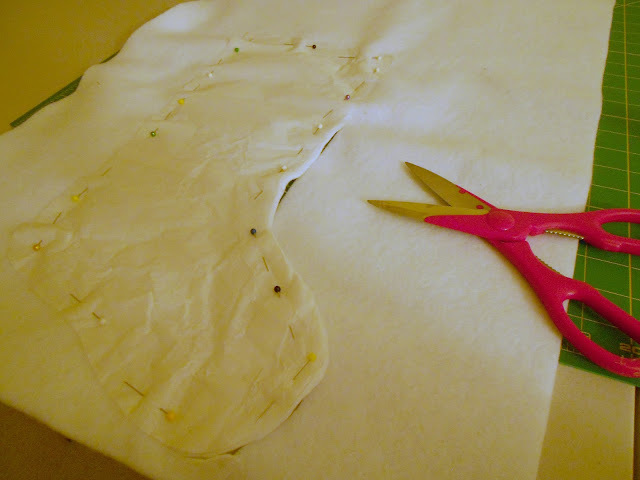 I used the felt lining as my template to cut out the outer fabric. Cut two at once with right sides together - this will make life easier! I cut a little wider than the felt everywhere EXCEPT the top of the stocking. Next, cut out the "lip" of the stocking or whatever you want to call it. Make the width wide enough so you can fold it in half and allow a little extra for the lip folding over. Aka, if you want the lip of the stocking to come down 4 inches on the finished stocking, cut it 4 + 4 +1 inch so 9 inches wide. 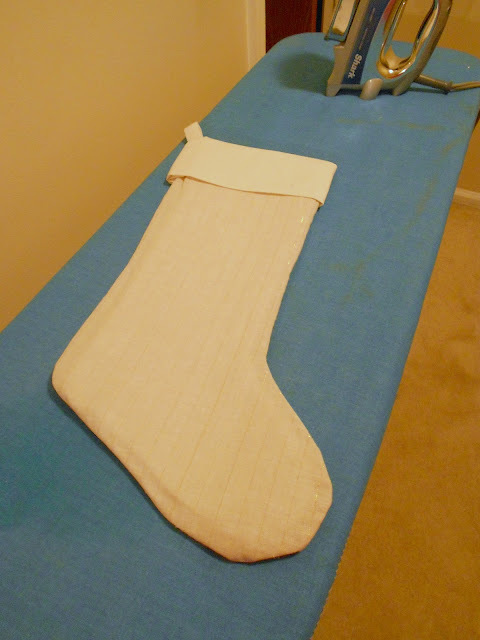 Length should be long enough to go all the way around the stocking plus an extra 6 inches. Do the same with the front fabric (right sides should be facing in already from when you cut the fabric) Remember to leave two inches open! Pin the fabric INSIDE the felt lining. Make sure the open portion of both stocking are lined up. Make sure your extra fabric is on the same side as the open seams. Sew all the way around the top! Beautiful! a lumpy half open stocking! Give it a nice little ironing. Looks better now! Set aside for a moment. Use a safety pin to help turn it right side out. Turn your stocking back inside out (ok, I guess you could have skipped turning it right side out in the first place, but I needed to check to make sure I did it right haha) and put the stocking hook inside the stocking with the ends lined up with the open seams. Use a sewing machine to sew right up to the lip fabric. Missed a pic between this step and the last...but turn the stocking back to right side out, and trim down the lip fabric.Bring the stocking hook out through the lip fabric. (It will make sense when you're holding it) Fold the two ends of the lip in and line up. 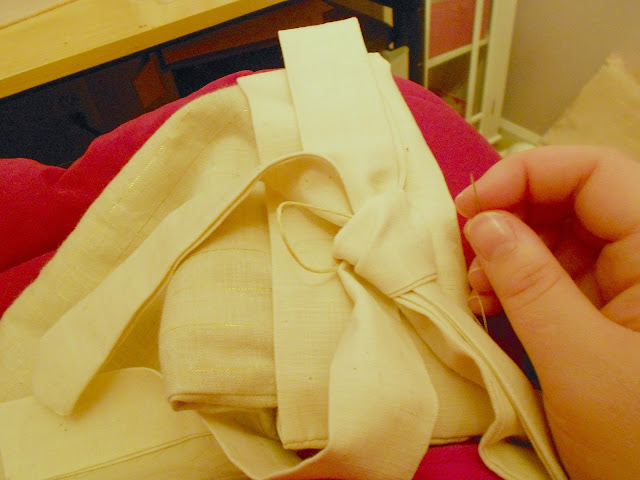 Sew together using a blind stitch. Tada!! Base of the stocking is done. Give it a nice little iron again. Now to embellish! I bought two wooden letters at a craft store and painted them gold so we could decipher between our stockings!! Cut out another long strip of fabric to use for the bow. Trim the ends sideways. Sew up the side and one end, then flip inside out and sew the other end by hand. 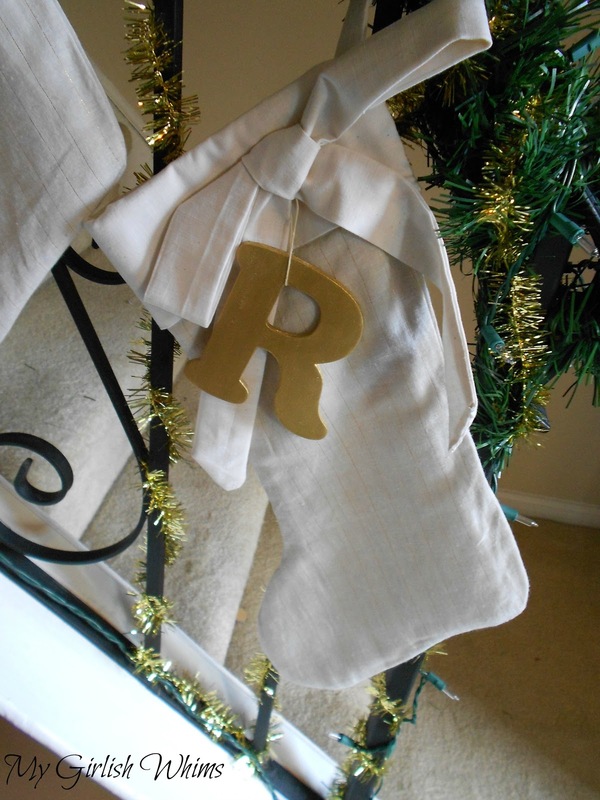 My stocking! A labor of love...but well worth it. Makes me want to learn how to sew more stuff! Excellent tutorial, and very pretty stockings! Three of those are in my future as well! Very cute! love the neutral with all of the greenery and white lights. you did a fabulous job! Great tutorial! 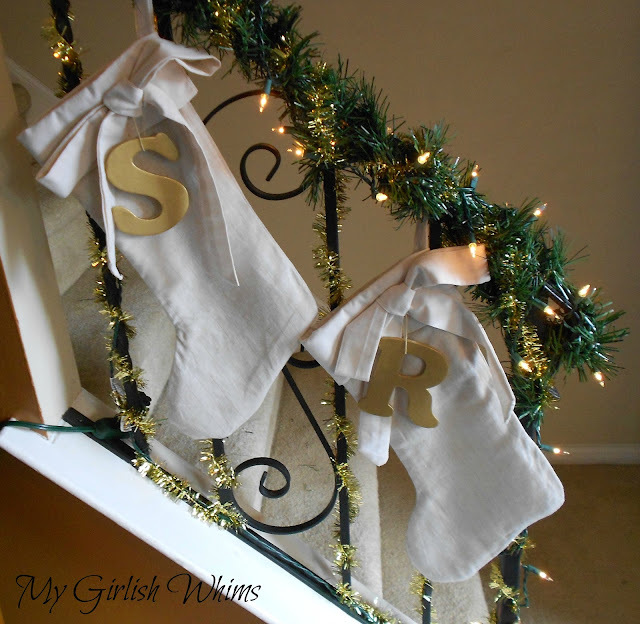 I have been wanting to make new stockings for ages and you make it look so easy! I had been mentally struggling with how to write names on the stockings and I really like your idea of just hanging a letter, so cute and super easy! Pinning this to do later!! Thank you!! These are PRECIOUS! 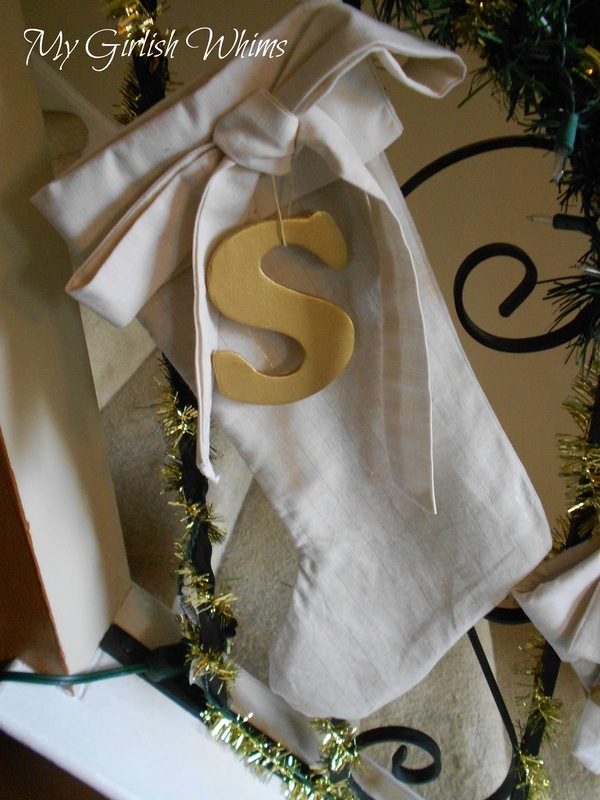 I've looked all over for the perfect stocking to no avail - I think I'm inspired to try to make some now! How cute! 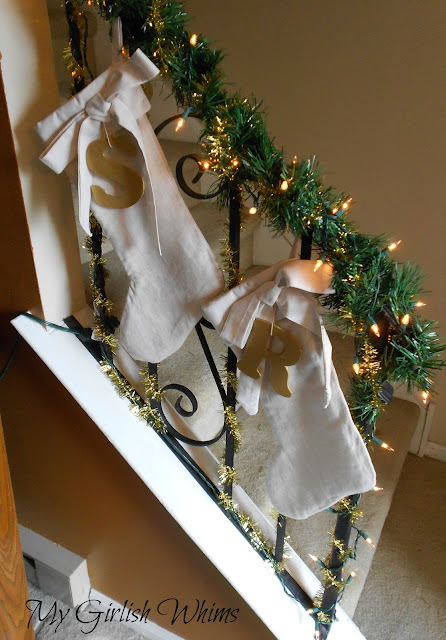 Never thought of making my own stockings, but you make it look easy. Might have to give it a try someday. Your stockings are beautiful. I love them!